Campus is in New Plymouth, Taranaki. Courses from Level 1 – 7 that serve the needs of their community, with some specialisations. The New Zealand Institute of Highway Technology (NZIHT) is fully owned by WITT, and is the largest provider of civil engineering technical and skills training in New Zealand. NZIHT’s campus is in HAMILTON. On the west coast of the North Island and known as the “energy province” for the rich mineral resources, but also a rich, flat, dairy farming region. At its heart stands Mount Taranaki. There are a huge variety of courses, with some specialisation in building and engineering courses, and related business courses such as Project Management and Operations Management. Nursing and Cookery are very popular courses too. Engaging, innovative, and flexible learning opportunities that are responsive to a diverse market and its community. Effective and rewarding academic experience for all learners with graduates who are prepared for employment or higher education. WITT is committed to providing an academic experience ‘that enables students to reach their potential’. International students as a whole achieve to a higher level than other students with excellent achievement in terms of qualifications and employment outcomes. WITT opened in 1972 and is the only state tertiary institution in Taranaki and offers courses from certificate to degree level across a wide range of areas, including Business, Nursing, Hospitality, Maori, Humanities, Media, Art, Electrical, Engineering, Automotive, Welding, Carpentry, Architecture, Computing, Fitness, Hairdressing, Beauty Therapy, Make-up Artistry, Early Childhood Education, Social Sciences and Agriculture. WITT is a largest provider of Highway Engineering programmes in New Zealand (NZIHT) which Taranaki is home to New Zealand’s Oil & Gas industry. To be the leading facilitator of excellent quality tertiary education outcomes in Taranaki. Government Guaranteed Institute of Technology: WITT is a high quality, Government owned and guaranteed, tertiary education institute situated in the Taranaki region of New Zealand’s’ North Island. Qualifications are approved by the New Zealand Qualifications Authority (NZQA). Engineering: Taranaki is recognised as New Zealand’s Energy province. The Taranaki region is home to New Zealand’s Oil and Gas industry with almost 90 percent of the sector’s total nationwide employment based in the region, generating $NZ 741 million GDP. The region is home to many national and international engineering companies. Hospitality: WITT works closely with hospitality leaders to create up to date, relevant qualifications. WITT’s popular Diploma in Professional Cookery is an extremely well respected qualification and many graduates have gone on to gain employment and New Zealand residency. Free Bus Service: Our Tertiary Bus Service allows WITT students to travel for free on all New Plymouth urban bus services provided by Tranzit Coach Lines, including travel from Hawera, Waitara and Oakura, on any day at any time (including weekends and evenings). Bus timetables are available in the WITT café or online at www.taranakibus.info. You will need to show your WITT ID card to access this service. Employment Focussed Education: WITT programmes offer the best in vocational education, where applied learning leads to real life success. WITT offers programmes from certificate, through to diploma and degree level. Great Weather: New Plymouth has fresh clean air and blue skies. It has a healthy and comfortable climate, not too hot and not too cold. Vocational Education: WITT qualifications offer the best in vocational education. Our courses have a strong applied learning component which supports the theory they learn in the class room. WITT offers qualifications from certificate, through to diploma and degree level. Safe and welcome region: Taranaki is a beautiful region of the beautiful country of New Zealand. The city of New Plymouth is friendly and safe. WITT qualifications and courses reflect the region's economic strengths as well as New Zealand employment needs. New Plymouth has also won the most liveable city award for populations 20,000 - 70,000 at the 11th International Awards for Liveable Communities in 2008. Taranaki: Rich in inspiration and history, the Taranaki region is a place where creativity and artistic expression abounds. Feed your soul and rejuvenate your mind. There is much to discover in Taranaki – the thrill of a mountain view, world class cafes and restaurants, the pleasure of a good time. To really enjoy our region is to experience it, explore it and find out what makes Taranaki like no other. Walk or cycle the Coastal Walkway and visit world renowned parks and gardens. From the mountain and National Park to the coast and everything in-between, Taranaki is never short of places to go – whatever the weather. With a population of just over 100,000 people, Taranaki is the 10th largest region by population for New Zealand. Taranaki is a centre for energy production, particularly oil and gas, and for dairy farming. 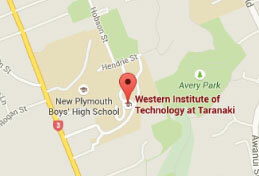 Western Institute of Technology at Taranaki (WITT) A student advisor will be in contact within one working day.